Good morning, y’all. I’m back on the blog today with an image heavy post in a continuation of our Artist Retreat series. Today, it’s a photograph explosion of the breakfast area and den. I am going to dub this as my orange crush, because let’s be serious, I am truly crushing on this space. When it came to the breakfast area and the den, when we came on the client already had the clearest vision for these two spaces. This is truly where the palette for the rest of the house started – specifically with the orange pendant light that had travelled from California with the client. We carried the grey walls from the entryway on to the back of the house in these more informal spaces, and then brought the deep, moody blue tone from the dining room into the den as an accent in the bookcases and mini bar area. As it turns out, orange is a spirit color in this house, and there were plenty of existing accessories and dinnerware that had that striking pop already in play. It made the orange color of the koi wallpaper in the powder bath an easy decision. Part of what makes any space feel warm, personal, and well, finished, is artwork and a well-styled space. We unpacked many boxes that hadn’t been opened in years – from before the couple’s journey from California – to find treasured books and objects to display on these built-in shelves. With an intimate seating arrangement, this room really excels with texture and a play on pattern and fabrics. This is a totally relaxed room, often serving as an afternoon napping spot, a place to watch a little tv, or to have great conversations with close friends. The secret to well-styled shelves? It’s all about balancing various forms, colors, and patterns so that your eye naturally travels around the collection. A single plate on one shelf leads to a shelf with a lot of vertical books followed by a horizontal framed print on the following one. A common color scheme helps tie in the various pieces. Perhaps my favorite feature of this room? The hidden bar. Painted the same rich, moody blue color, it’s an unexpected addition to the space. Add in some barware, a wine rack, and some unexpected original art, and this space is worthy of investigation. These three art pieces work together because they share a similar color palette, shape, and form. With gorgeous natural light from the back yard, this den truly invites relaxation. Love what you see? Need some help pulling your space together? We’d love to meet you for a consultation or afternoon design session and take on your design challenge. 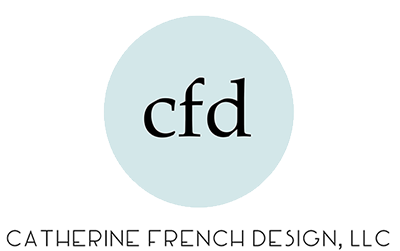 Reach out to us at hello@catherinefrenchdesign.com. All images were styled by the Team at Catherine French Design, LLC. All photographs were taken by J. Sinclair Photography. Arista Builders, Inc. was the general contractor for this project.